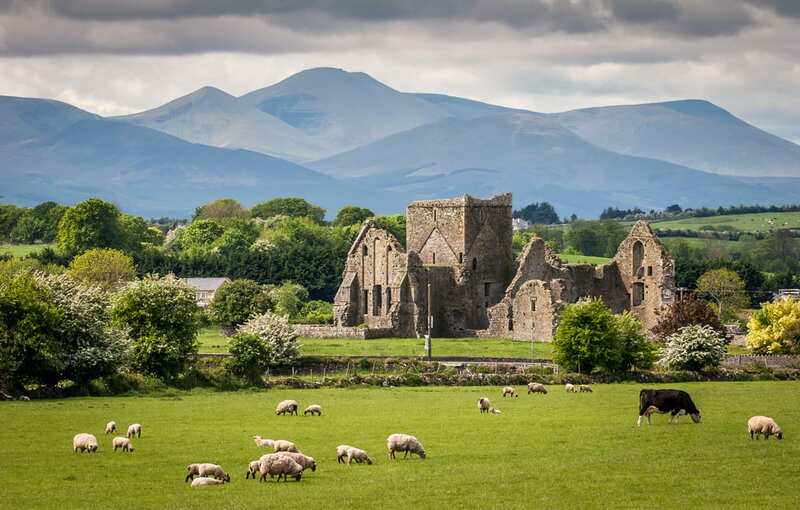 17 Breathtaking Sites to Include in your Ireland Itinerary - Don't Miss These Top Sites! Ireland is an island of enchanting history and Folklore, breathtaking scenery, and a fun-loving culture supported by friendly locals. See below for 17 can’t-miss sites on the Emerald Isle. Firstly, Limerick is located South West of Dublin, in the Midwest Region. It is driveable from Dublin and on the way to Killarney (see below). The city lies on the River Shannon, with the historic core of the city being King’s Island. It is a large, urban city with a large population compared to many other cities you may visit during your time in Ireland. Secondly, Adare is a small village in the county of Limerick, located farther Southwest (and enroute to Killarney) from the city of Limerick. 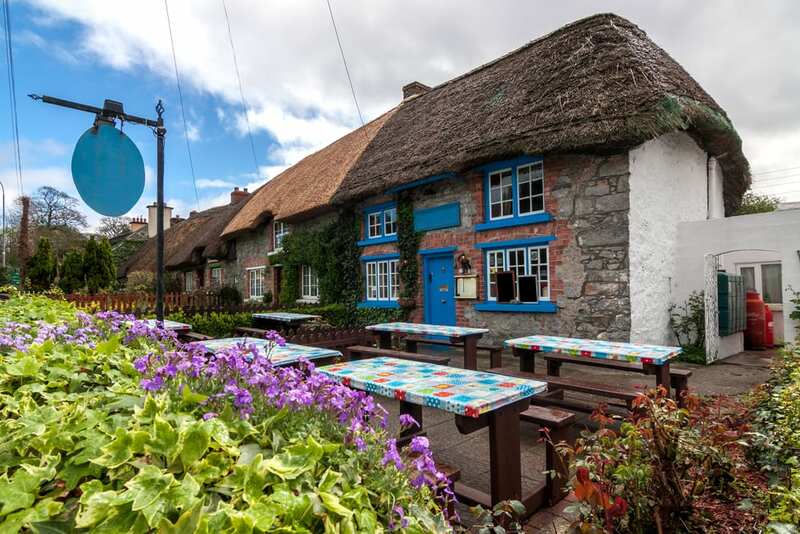 It is known as one of Ireland’s prettiest towns, with idyllic moss-covered buildings and colorful doors. In addition, it is designated as a heritage town by the Irish government. Killarney is a town located in the county of Kerry in southwestern Ireland. The town’s heritage, history, and location on the Ring of Kerry make it a very popular tourist destination and resort town. It is extremely picturesque and clean, with many things to see and do. Muckross House is a 65-room Tudor-style mansion, built in 1843. Killarney National Park and Muckross Lake surround the gorgeous castle. This structure is the base for exploring this breathtaking landscape. 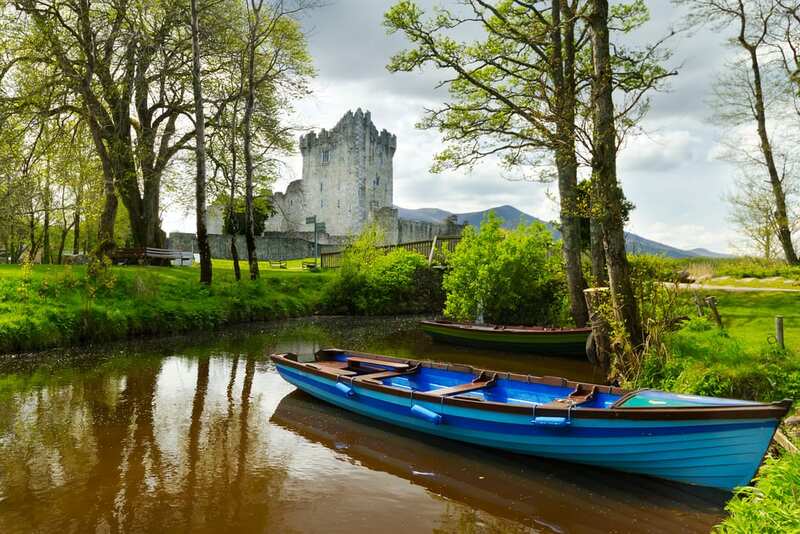 Also located within Killarney National Park is Ross Castle. It is the ancestral home of the O’Donoghue clan. It is open to the public with guided tours available. The Blarney Stone is located at Blarney Castle. Blarney Castle has a long history, originating as a timber house from before the year 1200. Located near the town of Shannon on the Ratty River. The current structure dates back to 1425, with history even before this date. Today the castle is a major tourist attraction, in addition to the Folk Park. Both the castle and Bunratty House are open to the public. The castle is famous for its medieval banquets. Bunratty Folk Park is an open-air museum featuring 30 buildings including the Ardcroney Church of Ireland. Theses sea cliffs run nearly 9 miles (14 km) along the Atlantic Ocean. 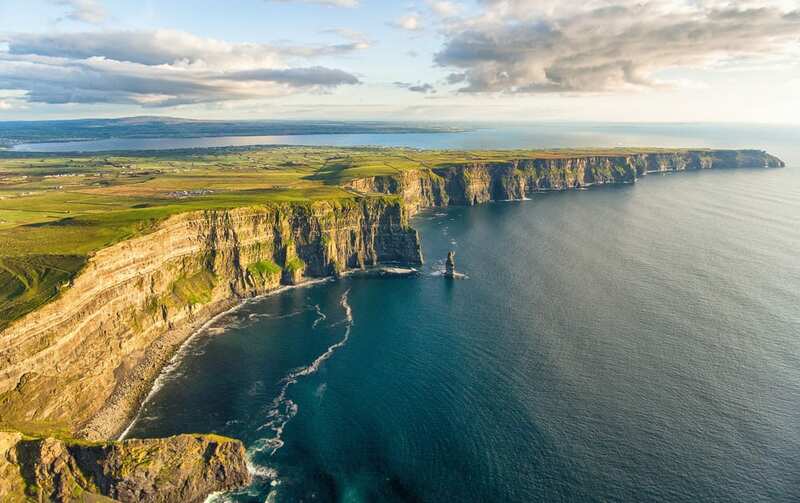 The cliffs are one of the most popular tourist destinations in Ireland and they are also recognized by UNESCO. The cliffs consist mainly of beds of Namurian shale and sandstone, and it is possible to see 300-million-years-old river channels cutting through the base of the cliffs. The views are, of course, stunning! Kylemore Abbey is a Benedictine monastery that was founded in 1920 in order to house the nuns who fled Belgium due to WWI. It is on the grounds of Kylemore Castle. Knock Shrine is a Roman Catholic pilgrimage site. According to legend, there was a “Marian apparition” (aka a “reported supernatural appearance”) here in 1879. It said that the Blessed Virgin Mary, Saint Joseph, Saint John the Evangelist, angels, and Jesus Christ all appeared at the shrine. A number of cures and favors are associated with those who visit Our Lady of Knock Shrine, and those who have claimed to be cured here still leave crutches and sticks at the spot where the apparition is believed to have occurred. 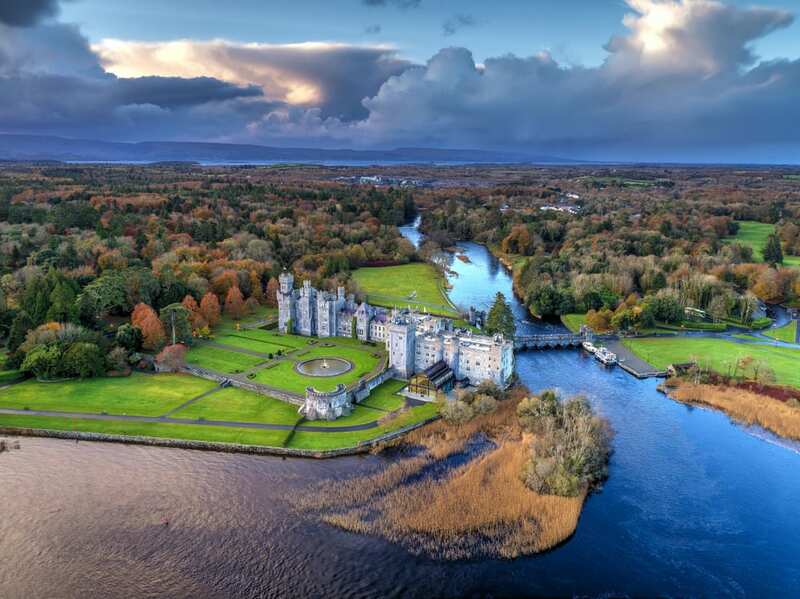 Ashford Castle is a medieval and Victorian castle-turned five star luxury hotel. Located near the city of Cong, the castle was once owned by the famous Guinness family. Many famous people have stayed here over the years including King George V, John Lennon, George Harrison, Oscar Wilde, Ronald Reagan, Robin Williams, Brad Pitt, and more. The oldest established Falconry School in Ireland. Here you can fly a Harris hawk around the spectacular grounds of Ashford Castle in a one-hour private Hawk Walk. The Giant’s Causeway is an area of about 40,000 interlocking basalt columns. These columns formed due to an ancient volcanic fissure eruption. It is now a World Heritage Site (UNESCO), in addition to a national nature reserve. According to legend, the columns are the remains of a causeway built by a giant. 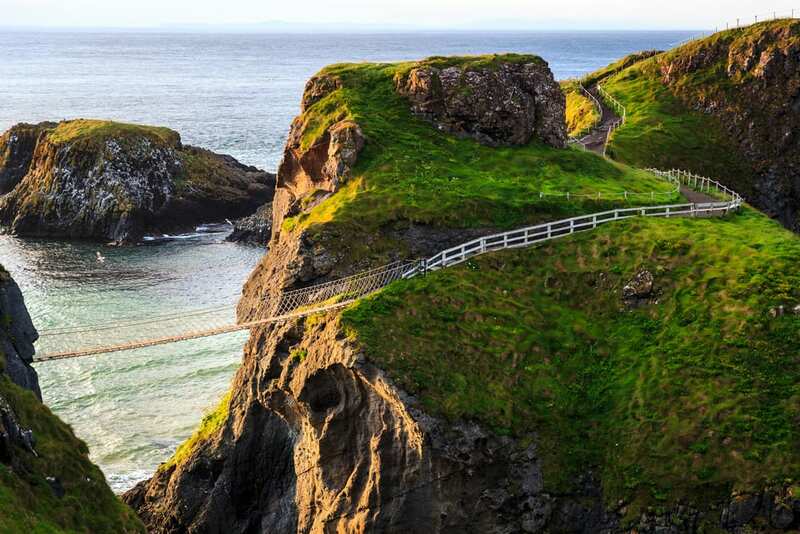 Carrick-A-Rede is a famous rope bridge that links the mainland to the tiny island of Carrick-A-Rede. It is 66 feet long and rises 98 feet above the rocks below. The bridge is open all year round and people may cross it for a fee. Antrim Coast is an official Area of Outstanding Natural Beauty. This area includes the coastline running from Ballycastle in the north to Larne in the south, in addition to Rathlin Island. Titanic Belfast is a monument that opened in 2012 in order to honor Belfast’s maritime heritage. It is built on the site of the former Harland & Wolff shipyard in the city’s Titanic Quarter where the actual RMS Titanic was built. Inside you will find nine interpretative and interactive galleries about Belfast and, of course, the sinking of the Titanic. 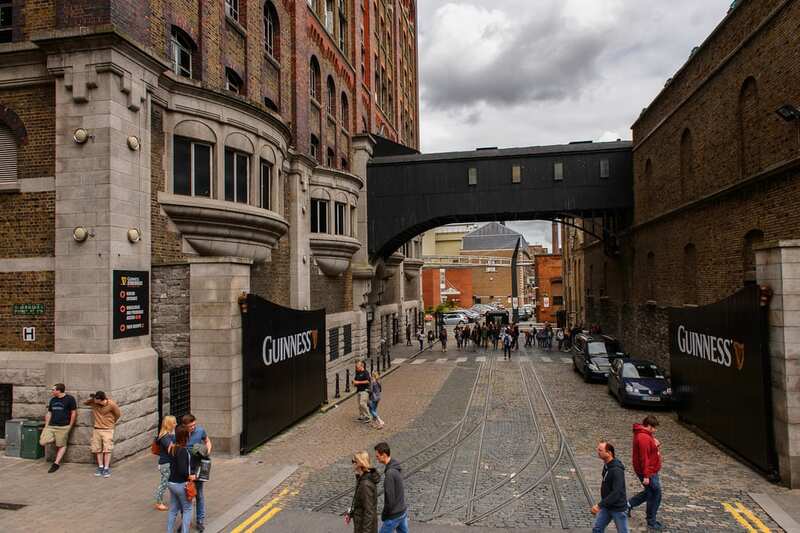 Lastly, the Guinness Storehouse contains seven floors that surround a glass atrium shaped in the form of a pint of Guinness. Here you can learn about the history of Beer through various interactive exhibition areas including ingredients and brewing, in addition to transportation and delivery, advertising, etc. Call us today at 402-281-3022 in order to speak to on of our Ireland specialists!